Here's a great and visual easy magic card trick where you cause a playing card to apparently float in air as if it's levitated or suspended above your hand. Watch a video of the trick in action here. You bring out a playing card and show it on both sides. You rest the card about half an inch above your palm-up hand and make a few adjustments. Suddenly, you let go of the card and it's seen to be floating above your hand as if it’s suspended in mid-air. You grab the card with your other hand and then show both sides of the cards. You have apparently broken the laws of gravity. You can learn other methods to float playing cards here. The card floats courtesy of a gimmicked card that I show you how to make. Using the picture as a guide, use the blade to cut a tab in the back of one of the playing card. Kids, please get your parents or an adult to help you with this. You'll notice that the tab in the picture is cut at an angle. This affects the angle at which the card "floats" over your hand. I happen to think that a non-perpendicular angle makes the effect look better, but you can cut the tab at any angle that you wish. Fold the tab up. It's this tab that will form the support for the mid-air suspension. 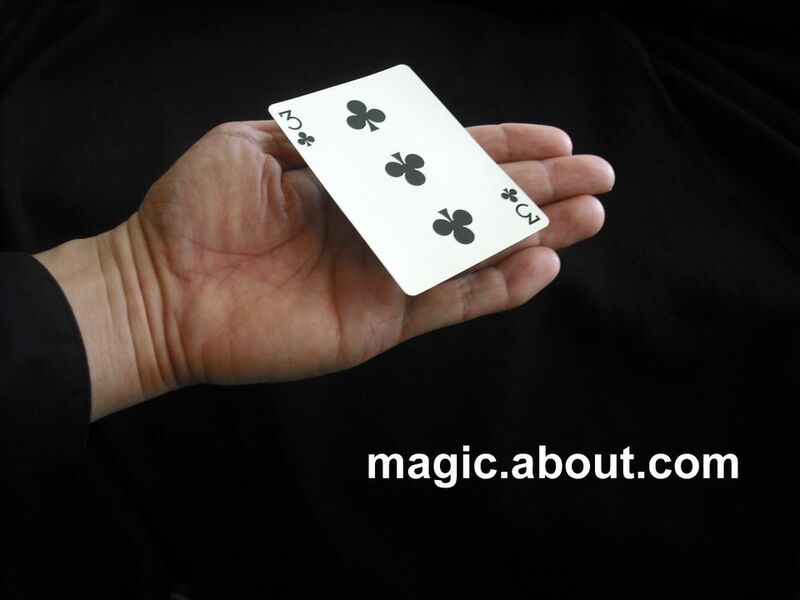 This image shows the tab in its folded-out position when the card would apparently “float” over your hand. Get the second playing card and spread glue on its back side. Note the areas where you apply glue. You don't want to apply glue to the area of the tab of the first card so that it remains free to move. Apply the gimmicked card with the tab to the card with glue. Be sure to line up the cards so the sides perfectly match-up. Also, it’s best to have the tab in the “up” position so that there’s no way that it adheres to the bottom card. Allow the glue to dry. The picture here shows the gimmicked card in its completed state upside down with the tab extended. Your spectators will not see the card at this angle. Before you start, press the tab into the back of the card so it's hidden. I'll assume that you will float the card over your left hand. If you want to float the card over your right hand, just reverse the instructions. With the gimmicked card face-up (tab side down), grab the card with your right hand - fingers underneath the card and your thumb on top. Use one of your fingers to hold the tab against the card in its hidden position. You'll notice that if you hold the tab down with a finger as you grasp the card, you can hardly see the tab. Casually show the card on both sides, you don't need to move quickly, Just briefly show the card's back side and then turn over the card so that it's face up. Hold out your left hand and display the gimmicked card face up with your right hand. Maneuver the card over your left hand and briefly rest the card on your left hand fingers. At this point, release the "tab" under cover of the card and allow it to "catch" on the fleshy part of the fingers of your left hand to open and fully extend the tab at a 90-degree angle to the card. As you apparently adjust the card with your right hand over the left, allow the tab to fall between the lower parts of your ring and middle finger and grab it there. Continue to raise and "adjust" the card with your right hand to cover the movements of your left hand. Raise the card until you can feel your fingers holding the end of the tab. With practice, you'll know when the card feels "right" and is being supported by the tab without any help from your right hand. At this point, you can briefly release the card and show that it's floating above your left hand. Don't hold the suspension too long. It's just a momentary thing. Grab the card with your fingers underneath the card and your thumb on top, with your finger holding the tab against the card in its hidden position. Casually show both sides of the card. You have caused a card to mysteriously float above your hand.